The world of RGB and SCART can be a confusing one. Understanding the difference between RGB with composite sync, sync on green, composite video for sync and the myriad of other types of signal that might come down a SCART cable often leads consumers to cable their systems up in a sub-par fashion. Even when you understand the basics, connecting things up isn’t always as simple as it should be. What if, for instance, you have a device such as the Playstation 2, that outputs sync on green when running in 480p/EDTV mode? If you’re not fortunate enough to have a display or processor that can handle sync on green, you’re going to need some kind of converter. Luckily, UK based AV experts Keene Retail Limited may have just the solution you’re looking for. Cased in a sturdy plastic shell measuring roughly 9cm by 7cm by 4cm, the SyncBlaster Black Box is a versatile RGB sync cleaner, splitter and converter. The unit has a standard SCART input and output, rather than the D-SUB15 (VGA style) output you would find on ArcadeForge’s popular Sync Strike. As well as the two female SCART sockets, the exterior of the unit has two banks of DIP switches and a 12 volt DC power connector. There are also several LEDs that light up to indicate what kind of incoming signal the unit is detecting. Unlike some other sync processors the Black Box cannot run by drawing power from the SCART cable itself, though considering how unreliable this can be it is probably for the best. On the top of the unit there’s a raised “Keene Electronics” logo, while on the bottom of the unit there are some handy instructions on how to configure the DIP switches. Frustratingly for UK buyers, it seems that the unit is only available with a 2 pin power connector, despite Keene being located in the UK. You can order a UK AC adapter at the time of purchase for an extra £5 or simply use any compatible 12 volt power supply you may already have. While the basic pack doesn’t come with any cables, if you need output cables to RGBHV or a D-SUB15 with separate sync, Keene can provide those too at extra cost. When compared to the Arcadeforge Sync Strike, Keene’s sync processor has one major advantage. The Black Box is capable of converting to and from sync on green. Feed in a RGsB (sync on green) signal and the box will happily convert it into an RGBs signal for you. By setting the DIP switches on the unit you can also strip composite video from an incoming signal, leaving just clean sync. This makes the Black Box an ideal match for the PS2. XRGB Mini users in particular have bemoaned the fact that when using a PS2 with the Mini, they must choose between component video output and 480p compatibility or RGB output and a cleaner, more vibrant picture. The Black Box promises to change all that, but does it work? Converting PS2 RGsB into RGBs for use with the XRGB Mini. Here’s GrimGrimoire running in 480p. We placed the Black Box between our PS2 and the XRGB Mini’s RGB input, configured the DIP switches according to the instructions and fired up the console. 480i screenmodes worked exactly as before and we eagerly fired up Open PS2 loader with its new, built-in GSM mode selector tool. Switching to 480p the Black Box did as promised and converted the signal into a 480p RGBs signal that the Mini could understand. However, the colours were incorrect. It was as if the sync on green signal was still left on the output. Frustrated, we tried changing the DIP switches and discovered that changing DIP B4 into the downward position cured the colour problem. According to the instructions on the base of the unit, when DIP B4 is down sync on green is not removed, which is somewhat puzzling. Perhaps the instructions are wrong in this instance. Whatever the reason, once the switch was correctly configured the results were great. The 480p picture was vibrant and noise free and after tweaking the scaling on the Mini everything looked great. 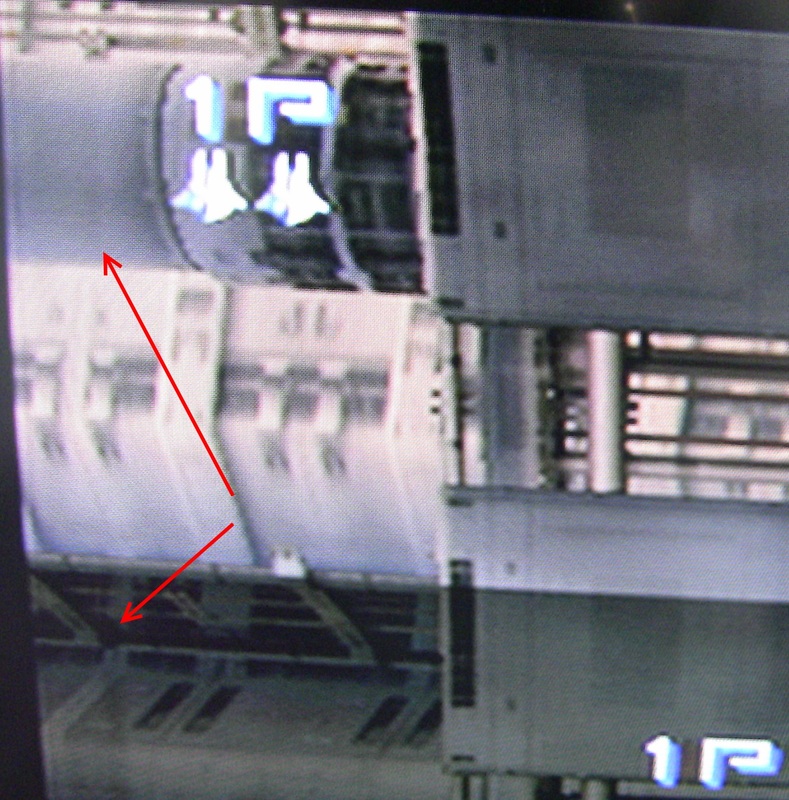 A faint band of discolouration can be seen on the left of the image. While picture quality was generally excellent, it’s not quite perfect. On the far left of the screen there’s a band that’s slightly discoloured compared to the rest of the image. It’s definitely not a deal breaker in our opinion but nevertheless worth pointing out. This band was present when we checked the image using the DVDO Edge and XRGB3 scalers too, though we’ve only tried one PS2 console (a PAL fat model with a O2 modchip and a luma for sync RGB cable). Update – We’ve been informed from other users that it affects their PS2 consoles too in the same way. We’ve tried to illustrate the problem with the digital camera shot on the left. You may need to click the picture and zoom in to actually see it. Other than this strange band of discolouration, we encountered just one other issue with the unit. In order to test the device as a general purpose sync cleaner, we placed it after our SCART switch box. In this position the unit worked, but every so often the LED for composite sync input would flicker. When it did, the Mini would lose sync with the input and blank the screen. Perhaps this was caused by stray voltage from the sync amplification on our SCART switch. These issues went away when we placed the unit before the switching matrix, though by doing this of course you limit its usefulness to just processing the one device. Is this a box worth buying? There’s no doubt the SyncBlaster Black Box is a neat little device. There aren’t many sync cleaners on the market that can handle such a wide range of signals. If you need to convert RGB with sync on green from a PS2, the only other alternative we’re aware of is to use an Extron interface. This is much more complex, since the Extron interfaces require a clean sync signal when using RGBs, so you can’t just plug in your PS2 SCART cable and expect to get a picture with every possible PS2 screen mode. If you just require a simple sync cleaner there are cheaper options on the market, such as the popular Sync Strike, which we can also confirm doesn’t have any problems when placed behind a SCART switching matrix. We’re not entirely convinced the small improvements in convenience and picture quality really warrant the £80 asking price, but if you are willing to pay the premium the Black Box will work perfectly as a PS2 RGB problem solver. 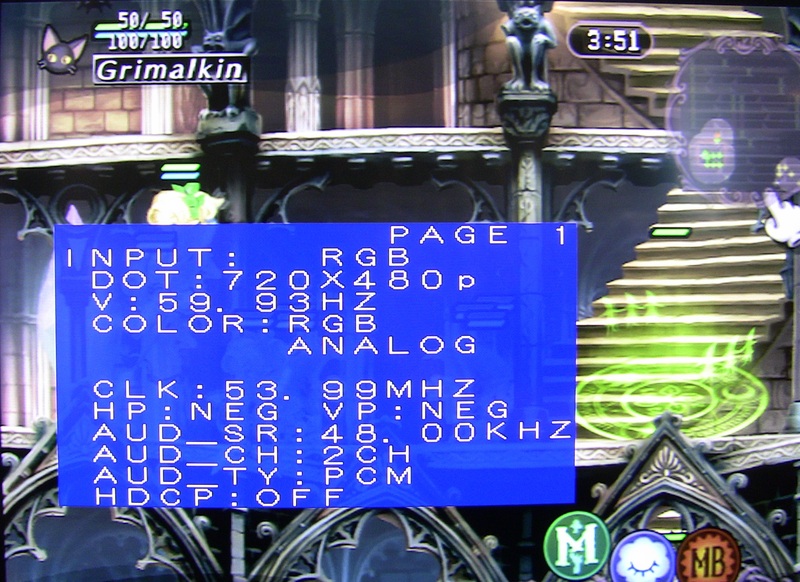 A handy little RGB troubleshooter especially for PS2 and XRGB Mini users, though somewhat pricey. Great article. Looks like there are a few bugs in the unit that push me to keep my Extron + SyncStrike setup. Too bad, because this unit looks much easier to use & simpler to cable. I don’t think there are any bugs in the unit? Are you referring to the banding, because that’s just as likely to be down to the Playstation as anything else. I have an Extron and a Sync Strike too but cabling it all up to compare would be a bit of a hassle, I’ll get around to it sometime though. Does it works like Extron? I will be able to use my ps2 with 240p, 480i and 480p on my XRGB mini? Thank you! It was a dumb question but I was in doubt with 15hz signals. Do you have any indication where I can buy it outside http://www.keene.co.uk/? The price there is discounted but I´m live in Brazil and shipping costs to here is too high! ( GBP 50). I need to find somewhere that can ship here using Royal mail registered. If you know, please let me know.